Random And Some: "I'm too fast. I'm too good and I'm too cool and you can't stop me"
"I'm too fast. I'm too good and I'm too cool and you can't stop me"
I just finished reading Be More Chill (2004) by American author Ned Vizzini. I first stumbled upon Vizzini's writing via It's Kind of a Funny Story, which I read last year and enjoyed very much, so I didn't think twice about getting Be More Chill when it crossed my path a little while ago. Jeremy Heere (yo!) is a dorky high school student at Leni Lenape. He doesn't quite fit in, however, with none of the girls showing any interest and bullies frequently tormenting him. The major bully is Rich, who one day at a party reveals to Jeremy that he should use a 'squip', a pill-sized supercomputer that communicaties directly with your brain after being ingested. Hoping to become a member of the social elite and getting his crush Christine to notice him, Jeremy purchases the pill. Klutzy loser no more! 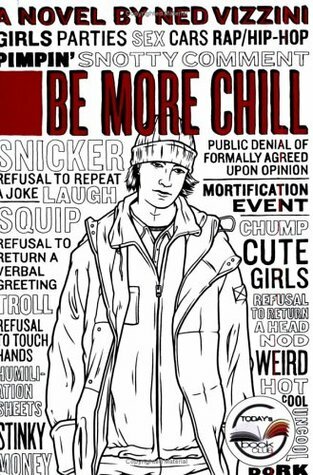 First things first: Be More Chill reads like a train. Vizzini's writing is so fresh, fun and wacky that you just want to keep reading, which is exactly what I did. I also like how the book sheds light on the bee hive that is high school, and all the lust and social scheming that come with it. While raising some thought-provoking questions about honesty and human relationships, Vizzini delivers a laugh-out-loud funny little brother for It's Kind of a Funny Story.